Helen Carmichael "Mike" Purdy loved Florida and its history. 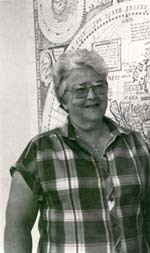 In particular, Mike loved Florida books and maps, and through Mike's service to the University of Miami Libraries she helped build an outstanding collection of rare and unique research materials. The national and international reputation of the Florida Collection, housed in the Special Collections of the Otto G. Richter Library, is, in large part, a measure of Mike's devotion, determination and dedication to her native state. In 1978, after years of service to the Cataloging Department, Mike was a logical choice to serve as the head of Archives and Special Collections. In this role, Mike's skills in locating, acquiring and cataloging Florida publications supported the Libraries’ ongoing efforts to enhance and expand scholarly holdings in this important area of research and teaching. Mike Purdy was a woman who left little to chance in life, and this included a firm desire to see the University of Miami Libraries continue to develop and improve its Florida-related holdings. To accomplish this lofty goal, Mike created a foundation, the Helen Carmichael Purdy Foundation, on June 13, 1990. Following Mike's untimely passing, the Foundation, through its trustees, continued the management of Mike's financial resources. Trustees of the Foundation, David Turner and Hagood Clarke, administer the fund and oversee investment decisions for the trust. These investments provide the Libraries with annual allocation of funds to continue the acquisition of rare and unique Florida materials. Their personal interest in the Foundation and its objectives has greatly facilitated the financial growth of the trust fund. The University of Miami Libraries is indebted to both of these men. The trust was created specifically to assist the Libraries in the "acquisition of rare or unique Florida materials . . .” and ". . . On very rare occasions the funds may be used for restoration of materials or compensation for personnel to process acquired materials." The purpose of the trust is to "provide funding supplemental to that of the University to assist the Department to achieve excellence to the extent possible." In the past eight years, the Special Collections department has carefully selected a compendium of rare and unique materials relating to Florida history, literature, religion, culture, science, agriculture, politics, environmentalism and social issues. Items acquired with the resources of the Helen Carmichael Purdy Foundation allow the Libraries to obtain scholarly resources far outside our normal financial boundaries. Concurrently, acquisitions supported by the Helen Carmichael Purdy Foundation enhance our existing Florida holdings, by strengthening the depth and significance of the thousands of books, journals, maps, newspapers, and collections of personal papers in the Libraries. The value of the Purdy Foundation to our undergraduate and graduate students, our research and teaching faculty, and all individuals interested in Florida history is, in a word, extraordinary. As the University of Miami continues to expand the number of faculty who teach and research in areas of Florida studies, as students and citizens explore the historical landscape of Florida, and as the Special Collections continues its mission to acquire, preserve and promote the history of Florida, the Helen Carmichael Purdy Foundation stands as a beacon of light. A beacon, much like the storied Key Biscayne Lighthouse here in South Florida. The Key Biscayne Lighthouse, much loved by Mike Purdy, is depicted on the special bookplate designed to commemorate items acquired with funds from the trust. The lighthouse, like Mike Purdy, stood firm and resolute for years, and both hold a special significance in the hearts and minds of South Floridians. Mike Purdy has left us a challenge, to continue her good works and build the finest collection of Florida research materials possible. The books, maps, manuscripts and research materials described herein represent our initial efforts. These rare and unique materials reflect the diversity of historical resources necessary for our students and scholars. Similarly, they reflect the broad collecting interests of Mike Purdy. In a memorial essay published in the 1992 edition of The Carrell: the Journal of the Friends of the University of Miami Library, librarian emeritus Archie McNeal wrote, "Mike was one of those rare people - a native Miamian - and she was deeply interested in the area . . . We owe a debt of gratitude to Mike for her untiring efforts and her loyalty and friendship." This exhibition presents a selection of the books, maps, pamphlets, letters and other research materials acquired with the support of the Helen Carmichael Purdy Foundation and is dedicated to Mike Purdy, in recognition of her many years of tireless service to the University of Miami Libraries, and with everlasting respect for her generosity and vision. This presentation was curated and prepared by William E. Brown, Jr. and Ruthanne D. Vogel in 1998. It was last updated February 9th 2007.